DESCRIPTION/HOW TO USE: Nail color remover with vitamin E. Pour onto cotton ball and wipe off Nail color, one nail at a time. For best results pay special attention to the area around the cuticles. The liquid has a transparent blue colour to it and smells predominantly​ of alcohol! Just 5-6 strokes of cotton is enough to remove the paint almost entirely from the surface of the nails.. After which one can do away with the area around cuticles..
1. Easily available and affordable! Buy it from here! 2. Travel friendly until you apply a hell lot of pressure over the bottle to break! 3. Removes the nail paint effectively, even from around the cuticles! 4. Doesn’t make the nails dry or rough! 1. Ingredients list is absent. 2. Smells of alcohol (Has alcohol!) . 3. Nails smell of alcohol even after washing hands thoroughly! Not sure why they didn’t mention ingredients list. They are required to list it. Yes.. It is consumer’s right to know the ingredients! Alcoholic smell is something we cant escape when it comes to nail paints and removers, I guess. 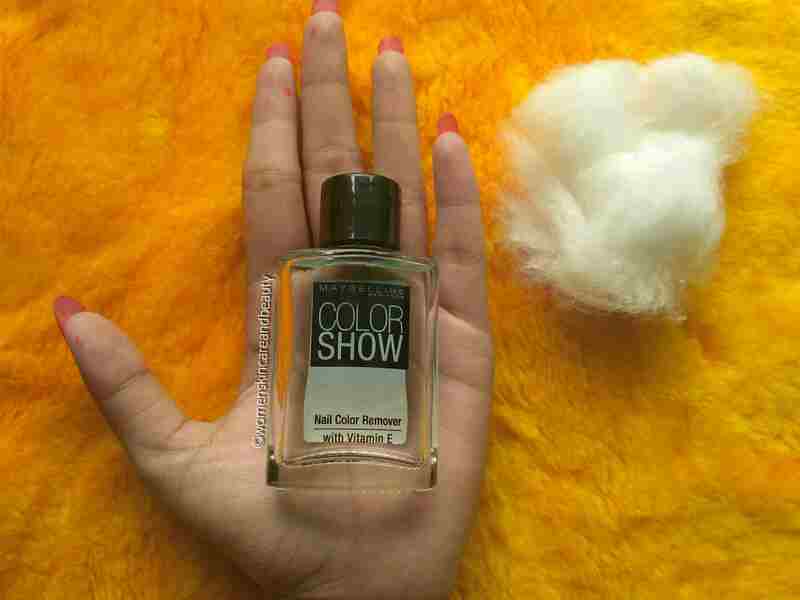 Thanks for the review hun..
Maybelline nail paint remover – wow, definitely in my list now. Affordable and good quality – but yes alcohol’s smell is a turn off. This is my all time favorite nail polish remover. Simply love it. I always need a googl nailpaint remover. something that does not affect the natural texture of my nails. this one sounds perfect will try this. The best part about it is that doesn’t dry out the nails which a lot of other brands’ remover do. Thanks for your review. Nice review. Like it. Although it has alcohol that is lasting for quite some time. Which i personally don’t like, but it has vitamin E also which is good for nails. So after finishing my nail remover i will definitely give it a try. It is an affordable nail paint removeer and the 3 yrs shelf life is again a pro for buying it. Yes.. it is really strong! This is just perfect as a nail remover. I don’t like the smell of alcohol at all. So I don’t think that I can use this nail remover. But rest all I like this and looks great. Like your honest review. Finnally got a product which is good to use and at the same time will give my nails that nourishment without harming it.